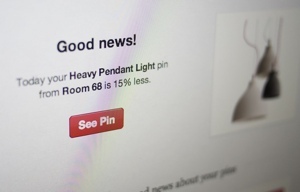 Pinterest, more than any other social network, carries a heavy emphasis on shopping. After all, its not unusual for the average Pinterest user’s page to have designer outfits, fanciful home décor items, stylish sneakers or other “wish list” type items pinned to it. In an effort to turn those wishes into a shopping reality, today Pinterest announced the launch of a new feature that alerts you when something you’ve pinned has fallen in price. Since May, the social network has been associating e-tailers’ prices with pinned items, allowing those who view your pins the ability to purchase what they see. Now, the site will send you an email whenever one of your pinned items goes on sale. According to Pinterest, they’ll use restraint with the new feature to keep from clogging your inbox, grouping multiple notifications into a single email. If you’d rather not get price alerts, you can change your settings on the site to stop them. The new feature goes live today. To learn more about Pinterest, check out Techlicious's primer on the social network.